The winter series of Bronze talks ended today with 6 people passing the exam, leaving them free to concentrate on finishing off the flying for their badges. More talks are scheduled in the coming weeks, on field landings, weather, and the intriguing subject of Error management in cross country flying. No doubt the briefing room will be packed as usual. 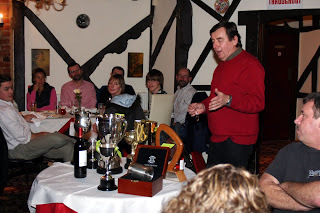 We've been too busy flying to report on our curry and prize-giving evening at the local Indian pub on Friday 23 Jan. About 40 members and partners attended for an excellent selection of tasty dishes, followed by the presentation of trophies by Denis, who also organised the evening. Achievements included most challenging turning point (Land's End), best progress, best cadet..........and most character-forming land out. More pictures may be found via the Photo Album on the home page and via the link on the menu on the right. A very busy day today. 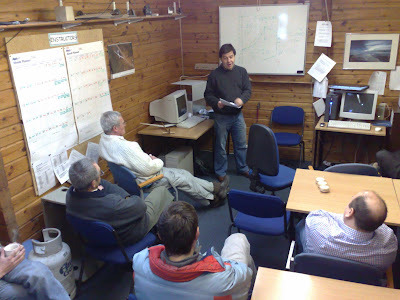 Julian had a packed room for his Bronze lecture on meteorology, then we had every club glider out of the hangar, over 40 flights on the log sheet. 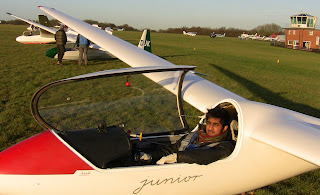 ... and Suresh Nahar to the Junior: Gary took an ex-military fighter pilot for a trial lesson and showed him how to use the rudder, he's going to come back and learn how to fly without an engine. 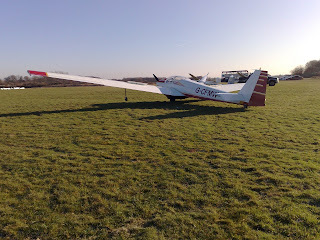 Then Gary went off to practise the aerobatic sequence for the Dan Smith trophy. The day ended with a team effort on washing the kit before putting it all away for next time. The day started quietly with no customers here until 10:30. Graham M. arrived with a friend who wanted a trial lesson & subsequently signed him up for an Intro+ course, setting a good example as Club Treasurer. The sun arrived as promised (made a change), tempting a couple of other members out to sniff the conditions. Regular Tuesday student Craig Cairns took to the air with Bryan for a series of stiff exercises & was rewarded by being sent SOLO for the first time. I think he's still smiling......... So, tea & biscuits all round at the end of a good winter's day! 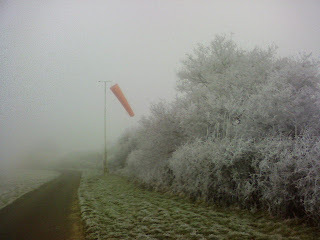 .......the fog and frost was not conducive to flying. Very pretty though. Bob Smith kicked off the 2009 Bronze C lecture series with a fascinating insight into Theory of Flight. His presentation also provided some great background from the likes of the the Wright Brothers through to NASA. After the lecture we had our first New Members intro session. This was an opportunity for new members to come along and enjoy the Club's hospitality - with mince pies, sasusage rolls, home made soup, wine and lots more to help the conviviality. It was a really useful way for members who may be new to the Club to meet others of a similar level as themselves. Nice to mingle also with many of the Club stalwarts and it was good to see at least one member rejoin Booker after having spent a year at another Club. No sun yesterday, so the temperature stayed low, but for the warmly dressed there was aviating to be done, and the gliding side seemed to be the busiest operation on the airfield. We had a couple of trial lesson visitors, some instructing, a few aerobatics to consolidate yesterday's lessons, and a first solo after only 15 flights for a helicopter instructor who has joined us to find out more about the pleasures of pure flight. Better for his bank balance too! Another successful day. Saturday 3rd January saw a forecast of clear skies, light winds and good visibility. 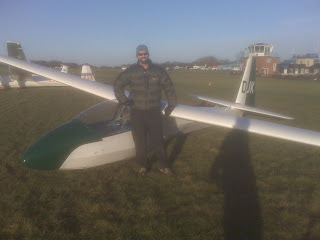 Judging by the logsheets, plenty of members spotted the improvement in the weather and took the opportunity to fly. We had a wide range of activities today - ranging from an aerobatics course led by Graham Saw, trial flights, introductory courses, pre-solo progression, early-post solo development, field landing checks in the motorglider and plenty of soaring. During the day we also had instructor training, type conversion preparation and currency checking all taking place. This kept two of the three K-13s, two K-21s, a Junior, a Pegasus, Motorfalke, the Pawnee and one of the Robins pretty busy for most of the day. We were pleased to welcome a couple of former Booker-GC pilots who flew in by motorglider to see what it's like at a busy site. 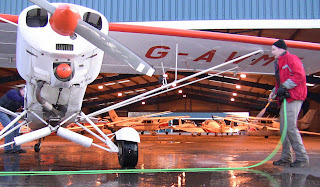 Hope they enjoyed the cooked breakfast at "The Pad" restaurant/bar which provides cooked food and drinks during the day and the chance to watch the considerable activity on the airfield. 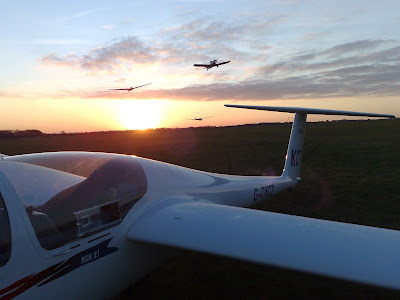 A couple of privately owned gliders took the opportunity to go soaring, much to the surprise of the visiting ex-members who seemed to think that soaring flight in today's conditions could only be achieved with the help of an engine. 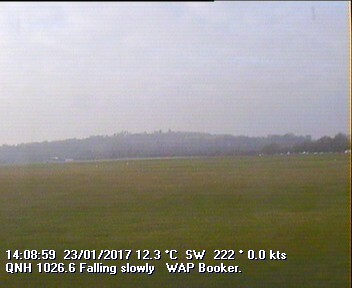 Jim White in ASW27 Z12 provided a good demonstration of what can be achieved at this time of year with a flight lasting over 1 1/2 hours and thermals climbs averaging more than 2kts+ up to 3000'. The day was brought to a wonderful close with the sight of a pair of K-13s practicing dual towing behind the Pawnee as the sun was setting. 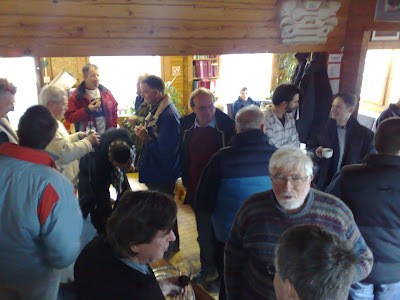 A debrief for the aerobatics course participants followed by drinks in the bar brought the day to a fantastic end. Here's to more of this in 2009!